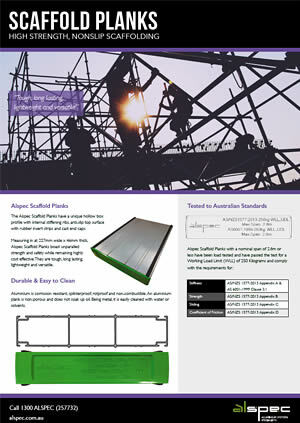 The Alspec® Scaffold Planks have a unique hollow box profile with internal stiffening ribs, anti-slip top surface with rubber insert strips and cast end caps. Measuring in at 227mm wide x 46mm thick, Alspec® Scaffold Planks boast unparalled strength and safety while remaining highly cost effective. They are tough, long lasting, lightweight and versatile. Aluminium is corrosion resistant, splinterproof, rotproof and non-combustible. An aluminium plank is non-porous and does not soak up oil. Being metal, it is easily cleaned with water or solvents.